We’re not here to sell cookies! 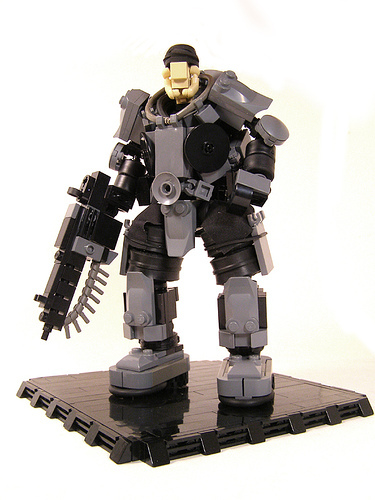 Legohaulic presents a sculpture of Marcus Fenix from the Xbox 360 game Gears of War. This creation has a lot going for it. In addition to being a great representation of a cool character from a cool game, Legohaulic uses pieces in some very interesting ways. Check out the tan minifig arms used for Marcus’ jaws, the tires and wheels on his arms, and the minifig capes around his hips. Oh it’s not THAT good a game! It is however, a great character sculpture! There’s lots of pieces in here being used in ways I would never have imagined. Gears of War is such an awesome game. I think that you really represented Marcus well.